It has been said that the philosophy in the classroom in one generation will be the philosophy taught in the government in the next. This last week, we found that statement to be true once again. Corrupt and misguided government officials who refused to vote down Planned Parenthood and the slaughter of the innocent are calling to probe Dr. Walter Palmer and the guide that hunted down Cecil the lion. They are even considering extradition. Of course, in close pursuit are those who are falling in line with global narrative and initiative. These are the young indoctrinated, uneducated, unloving and uncaring protesters who were calling for the prosecution, and even the execution, of Dr. Walter Palmer. As a matter of fact, on Wednesday, one of these people went so far as to vandalize Dr. Palmer's Florida home by spray painting a huge statement on his garage door "Lion Killer." The protesters, all 15 of them, were given headline attention. They made themselves known by holding signs that stated such things as "I am Cecil," "Let the hunters be hunted," "Murderers," "Killers," "Rot in Hell" and going so far as to demand "Justice for Cecil." Now, I want you to pay close attention to the fact that these will protest and call for justice when it comes to the death of animals, but could care less when it comes to the life of a human being. These are called reprobates. A reprobate is a person who is abandoned to sin (Lawlessness 1 John 3:4); lost to virtue or grace, according to Webster's 1828 Dictionary. These are the "useful idiots" that are being used to make way for the criminalization of those who pick flowers in state parks, or those who may tamper with an eagle's egg or kill a whale. These reprobate minds are responsible for calling forth protests when it comes to Kentucky Fried Chicken and their "cruelties to chickens." 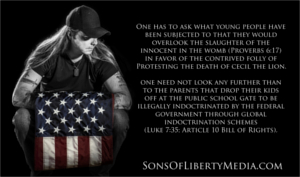 One has to ask what these young people have been subjected to that they would overlook the slaughter of the innocent in the womb (Proverbs 6:17), yet are willing to be made fools in the face of this contrived folly. I can tell you, one need not look any further than to the parents that drop their kids off at the public school gate to be illegally indoctrinated by the federal government through global indoctrination schemes (Luke 7:35; Article 10 Bill of Rights). These agree in action with the Planned Parenthood Margret Sangers of the world, "The most merciful thing that a large family does for one of its infant members is to kill it." Yet, don't touch Cecil. The mercies of the wicked are, without a doubt, cruel. Here's their message: Do not worry about the innocent human beings in or out of the womb but get on the street and protest if anyone dares to kill a lion. Remember, friends, one protester had a sign that said "I am Cecil." Not only is this a sick mindset, but it is also a very dangerous mindset and one that is not new. The great Christian theologian G. K. Chesterton famously said, "Wherever there is animal worship, there is human sacrifice." How true that is. But this is the fruit of a nation that has given way to a carnal mindset and turned its back on God; the same God who gave us what we have through His Son Jesus Christ!